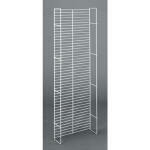 We have Store shelves available in two configurations. The full gondola and the half gondola. What is unique about the full and half gondola is they are both assembled with the same pieces. The half gondola as depicted above typically is placed up against a wall and the wall provides support of the shelving unit from overturning and tipping. Applications that are from 6' high and above: it is recommended to anchor the uprights of the shelving unit to the wall with our specially made wall anchors. 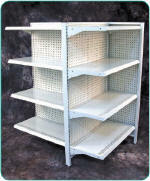 A Basic Upright with Cap, one Base Shelf, one Kickplate, one Back Panel and one Top, Center, and Lower Spanner is included in a section of Wall Shelves. If the Gondola is 78" tall or taller, the section would also include one Splicer Spanner. 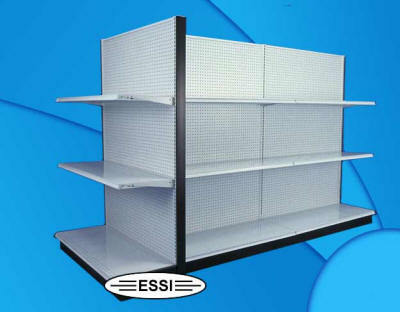 Gondola End Caps for Store Shelves are configured from a single sided wall unit in a double back configuration that sits flush against a Gondola Section. A single sided will provide the most strength and be the most affordable End Cap as it configured using typical Gondola Shelving components that are compatible with either single sided or double sided sections. We have available gravity feed bottle displays and free stand display refrigerators for all types of bottled or canned beverages. 5-Tier Merchandiser Features: • 5 Tier counter top display • Shelf depth ranges from 4½" to 8½" • Each tier includes welded sign channel 14"W x 1½"H Size: 21"H x 15"W x 9"D Color: Black Case. 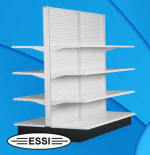 Slatwall Panels designed to mount on to an existing wall surface allows merchandising on a wall surface.